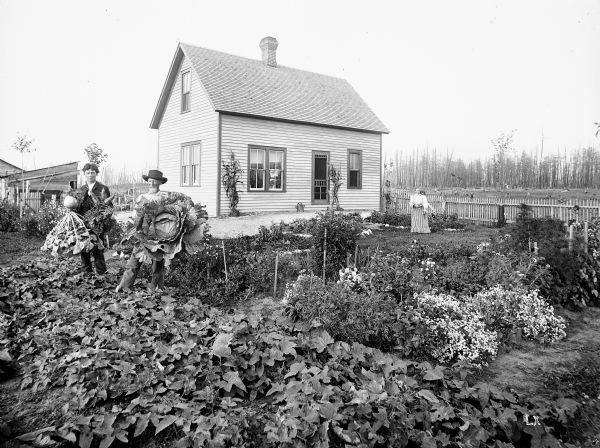 Julius Koehler family in their garden in front of their newly built frame home. The original Koehler farm was destroyed by forest fire in July of 1894, evidence of which is left in the burnt trees in the background. Variant: Hand-Book, page 43. Exceptional document. This image is one of many that was created for and appeared in "Northern Wisconsin: A Hand-Book for the Homeseeker" (1896), a promotional survey for the Wisconsin College of Agriculture by W.A. Henry. Henry was the Dean of the College of Agriculture at the University of Wisconsin.